I wasn’t planning an update but I noticed something I thought I’d share. Its not an update on my skin’s progress though, but on the amount I’ve been using. I can’t show you the full bottle because when the bottle is full, you can’t see the liquid level. 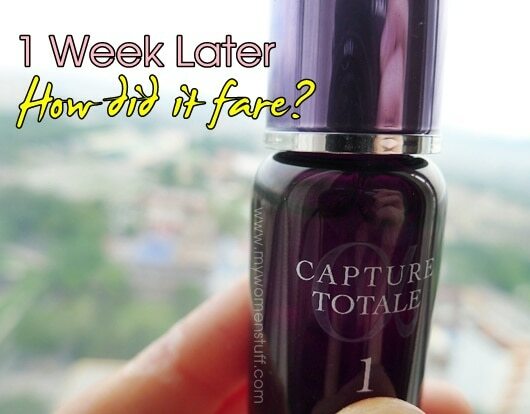 I tried to take a picture of the Week 2 and 3 serum vials, but they were opaque. I think its to do with the concentration of ingredients. 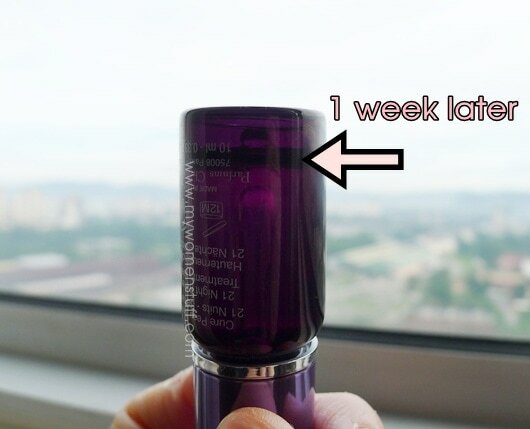 Anyway, here’s a picture of the serum vial for Week 1 after 1 week’s use nightly. I’m shocked. The liquid level has barely dropped! I thought my eyes were playing tricks on me. So I upended the bottle to make doubly sure. So from a 21 night renewal treatment, I think I’m looking at a 3 month treatment. 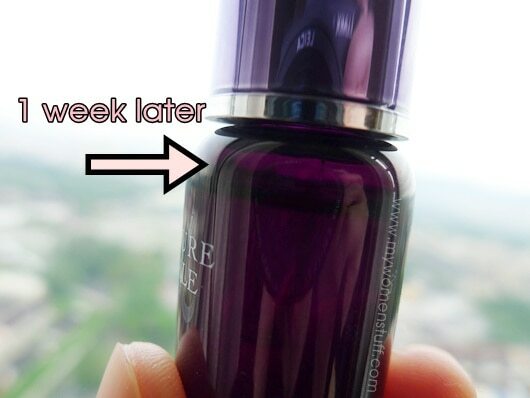 Just very briefly, after 1 weeks use, I’m supposed to notice brighter more refined skin. I’ll testify to more even toned skin, not necessarily brighter. I must be honest that because I do make the effort to take care of my skin, and I have been using many treatment serums in the past few years, I cannot say that I am noticing anything drastic in this 1 week. I will admit to more even toned skin with less redness in the cheeks but its minor. Perhaps if you do have more untreated skin damage, changes would be more pronounced. I’ll update once I finish up the treatment, and I’m afraid it won’t be in 21 days! NEXT POST: Your Say: Does a celebrity endorsement influence your beauty purchases? WOW!!!!! it seems that it’ll last longer that we thought!!!!!!!!!!! 740/ 3 months maybe i should give it a try too!!!!!!! Well it looks to be that way anyway. nice.. in that case its not too bad for 720 probably can last even 2mths looking at it. 😀 Good to know rm740 lasts a long time..muahahaha! I have a curious question~! Does each vial have a life limit (e.g. a week) after a bottle have been opened? Oh I know the type of products you mean. I checked but there’s nothing on the box or instructions to say that I MUST finish up a vial within a week. All it says is that I should use up all 3 bottles because each bottle has different levels of concentration of ingredients to improve on the skin. ooh, thank you for the info~!